UkuuPeople offers a number of Add-ons, so that you can integrate your tools with UkuuPeople CRM. Some of the Plugins/Add-ons we offer are Mail Chimp, Gravity Forms Add-on, CSV Import/Export, and Give. 1. First, purchase and download the plugins here. Tip: If you keep your purchase confirmation page up, it will make the licensing process quick and easy. But you will also receive an email with your purchase confirmation and license codes, so no worries. 2. 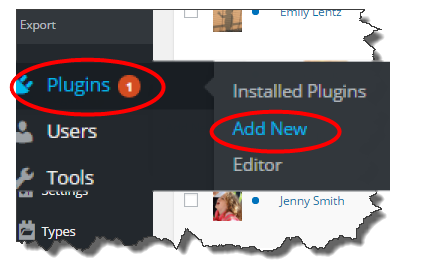 At your site's WordPress Dashboard, go to Plugins > Add New on the left hand side column. 3. Click on the Upload Plugin button at the top of the page. 4. Now click on the Choose File button in the center of the page. 5. Find the zip file you had saved (usually in your downloads folder) and open it. 6. Click the Install Now button. 7. Once the program has installed, you will be asked to Activate it. go to your confirmation page or confirmation email for the download, copy the license key, and paste it in the space given. Then click on the Activate License button. 9. Good for you! You now have a brand new plugin to use! It will show up under your plugins in the left hand side bar and will be listed in your installed plugins page, where you can activate, deactivate, view details, and more.